Author(s) Wong, Tom K.; Wong, Tom K.
Immigration has been deeply woven into the fabric of American nation building since the founding of the Republic. Indeed, immigrants have played an integral role in American history, but they are also intricately tied to America's present and will feature prominently in America's future. Immigration can shape a nation. Consequently, immigration policy can maintain, replenish, and even reshape it. Immigration policy debates are thus seldom just about who to let in and how many, as a nation's immigration policies can define its identity. This is what helps breathe fire into the politics of immigration. Against this backdrop, political parties promote their own narratives about what the immigration policies of a nation of immigrants should be while undermining the contrasting narratives of political opponents. Racial and ethnic groups mobilize for political inclusion as immigration increases their numbers, but are often confronted by the counteractive mobilization of nativist groups. Legislators calibrate their positions on immigration by weighing traditional electoral concerns against a new demographic normal that is reshaping the American electorate. At stake are not just what our immigration policies will be, but also what America can become. What are the determinants of immigration policymaking in the United States? The Politics of Immigration focuses the analytical lens on the electoral incentives that legislators in Congress have to support or oppose immigration policy reforms at the federal level. 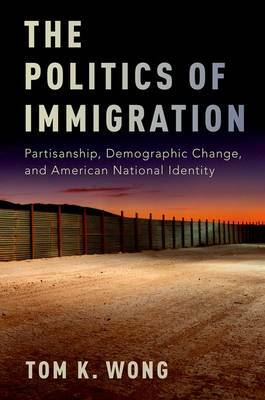 In contrast to previous arguments, Tom K. Wong argues that contemporary immigration politics in the United States can be characterized by three underlying features: the entrenchment of partisan divides among legislators on the issue of immigration, the political implications of the demographic changes that are reshaping the American electorate, and how these changes are creating new opportunities to define what it means to be an American in a period of unprecedented national origins, racial and ethnic, and cultural diversity.